South of Rum, leave the desert behind for the indigo colored waters of the Red sea. In the resort town of Aqaba, stroll the tranquil beaches, or swim out a short distance to the coral reefs, adorned with untold species of plants and fish. Relax and remember all that you have seen: the welcoming and gracious Jordanian people, and the heritage and beauty of their land. When fantasy, sun and sea meet the charms and atmosphere antiquity, the visitor can find himself, at any time of the year, at the Red Sea resort of Aqaba. For water sports and winter warmth, Aqaba is warm, sunny and inviting, fringed with palm trees, lapped by the crystal clear waters of the Gulf of Aqaba, cooled by a steady northerly breeze, and ringed by mountains that change in color with the change of the hours. 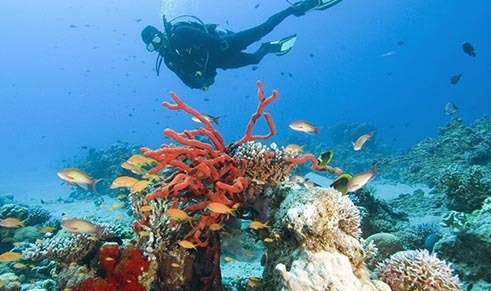 A dazzling undersea world of coral, fish and other marine life is just meters off the sandy beaches. Snorkeling, water skiing, wind surfing, fishing and a variety of other water sports, including unsurpassed scuba diving are popular. 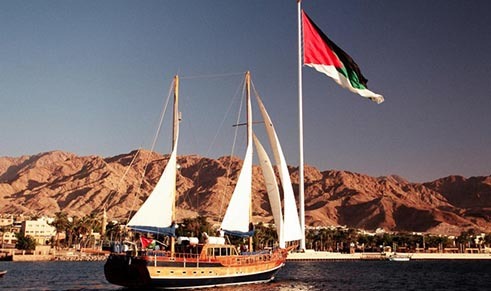 For the history enthusiast are sites reflecting human habitation for least 5,500 years, resulting from Aqaba’s strategic location at the junction of land and sea routes from Asia, Africa and Europe. Of special interest among the ancient and medieval archaeological sites are the early Islamic city called Ayla, Aqaba fort, built by the Mamluk Sultan Qansawh el Ghawri at the beginning of the 16th Century, and a very fine museum at the house of Sheriff Hussies bin Ali, great grandfather of King Hussies. Whatever the visitor’s interest, a wide range of hotels provide excellent accommodations, facilities for all water sports, and restaurants that cater to the most selective tastes.